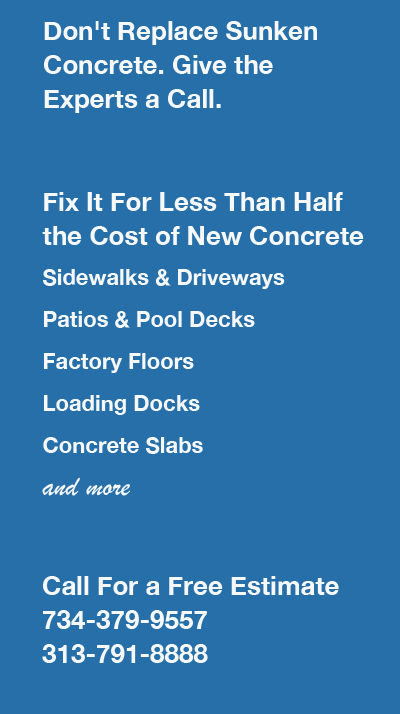 Accurate Concrete Raising can fix your sunken concrete for less than half the cost of new pavement. It’s very likely the concrete at your home or business will sink or settle sometime in the future. There are a number of reasons for this: the earth beneath it naturally settles over time, soil erosion can cause concrete to buckle, or improperly installed concrete concrete can cause it to sink. Once the concrete does sink or settle, walking and driving hazards present themselves, water runoff may begin to be a problem, and unsightly buckling could detract from the value of your house. We can solve your sidewalk and pavement problems in a timely and cost-effective manner. Using a process called Mudjacking, we can provide a cost-effective solution to your concrete problems. Mudjacking is a technique that involves lifting and stabilizing concrete slabs. Unlike other solutions, such as breaking up existing concrete and repouring new driveways and sidewalks, mudjacking raises your existing concrete. The Accurate Concrete Raising Specialists will fix your concrete with a minimum of inconvenience and down time, and save you money at the same time. Mudjacking is a straightforward process. Small holes are drilled into the concrete. A grout mixture is pumped into the holes under pressure and raises the slab hydraulically to the correct height. The holes that were originally drilled are filled with concrete. While it is not a complicated process, it’s still not a do-it-yourself job. Amateur work can result in irreparable cement damage that may cost more to repair or replace than the original damage. Let the Experts solve your concrete problems. We’ll come out, assess your concrete, and let you how we can fix what’s wrong. Call Accurate Concrete Raising today at 734-379-9557 or 313-791-8888 or use our handy contact form. Read more on the How Mudjacking Works page.